9" x 10 1/2" x 9"
VERY NICE! I like everything about this piece! The colour, the items, I like dolls, especially decontructed dolls, so much expression! Your boxes are very nice - like picture frames you could venture inside if you so wish. You are growing in leaps and bounds!!! Fantastic display. Always interesting to look in your boxes! Beautiful artists' box! Very strong design. I love your artwork. I can feel the process in this one!! 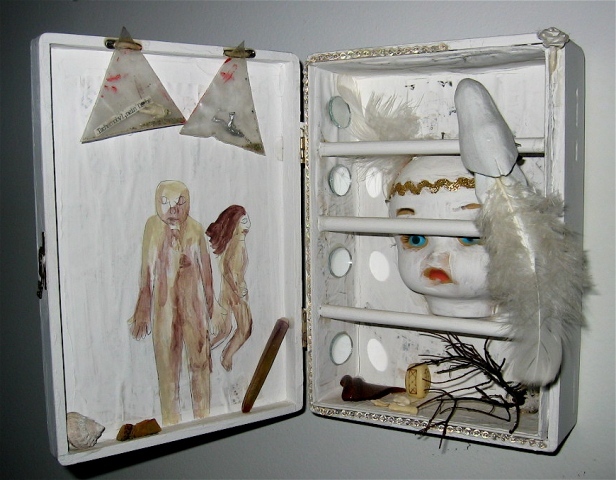 Extraordinary assemblage work ..Jennifer...so nice and has high level of creative expressions..
out--WOW! You've outdone yourself in intrigue...Collage-Nikov. minimum survival kit ? genial !!! have a lovely day Jennifer ! Un assemblage absolument créatif et de bon goût.